From Bash to Zsh to Fish! First of all. This is related to me, not anyone else. You might not like it, you could even hate it. I could also have some wrong information (feel free to correct me if I do). If that is fine with you, continue reading. If you don’t even know what a shell is. Simply put, the shell is a program that takes your commands from the keyboard and gives them to the operating system to perform. When you open your command line (terminal) you run a shell, a program. By default you probably have Bash (Bourne Again Shell). Zsh is an extended Bourne shell with a large number of improvements, including some features of bash, ksh, and tcsh. Loadable modules, providing among other things: full TCP and Unix domain socket controls, an FTP client, and extended math functions. The built-in where command. Works like the which command but shows all locations of the target command in the directories specified in $PATH rather than only the one that will be used. Named directories. This allows the user to set up shortcuts such as ~mydir, which then behave the way ~ and ~user do. I used It for a long time but lately I came across Fish! Another shell, and has a weird name I know. It stand for Friendly Interactive SHell, and boy I fell in love ❤! I’ll be robotic here. The Fish shell attempts to be more interactive and user-friendly than former shells. The goal is to give the user a rich set of powerful features. One of the things I liked about Fish, or the best things I liked about it is the autocomplete and suggestions are inline and works for almost anything and its based on history and what not. so for example, it works with switches like ls --he and it gives you ls --help. It also great that all of this happens like in real-time. So you’re typing a command, the command color is red, the suggested completion is in muted-grey, and once you type the correct command then it will turn into white, or blue, depends on you. The grey is the suggestion, `s` is not recognized as a command so its red. Pressing the Tab key will list all known parameters, and what they do. This is done by fish going through the “Man Pages” of that particular program. I know that this can be done in other shells, but it requires you to do so. Fish has this by default. Fish shell replaces the logical operators used by bash like “||”, “&&”, and “!”, and replaces them with “and”, “or”, and “not”. This makes it way more readable. Not much, but, it worth mentioning. Error messages are more obvious and easy to understand. Scripting with Fish is pretty great compared to bash. Its syntax is simple, clean, and consistent. Pretty much look like python. Ubuntu: for some reason, you always have to add a damn repository before you could install anything! Open a new terminal session, it should now load with the Fish shell by default. You can enter help and hit enter, this open the user documentation in your default browser. … and then visit http://localhost:8000/ in your browser. These will help you setup themes and plugins. Oh My Fish provides core infrastructure to allow you to install packages which extend or modify the look of your shell. It’s fast, extensible and easy to use. 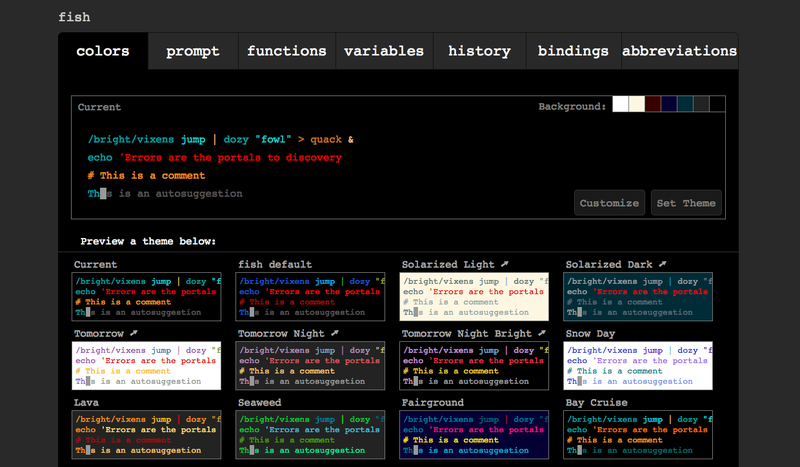 Tacklebox is a framework for the Fish shell that makes it easy to organize and share collections of useful shell functions, tools, and themes.